During the years leading up to the American Civil War, a period of westward expansion, many writers and artists wished to immortalize the life of the native Indians in their works before they died out. Prominent among them was the painter of German origin, Charles Ferdinand Wimar, who came to be nicknamed the “painter of Indians” for devoting most of his short but prolific artistic career to these people and for his habit of dressing like them. The Lost Trail is one of the five versions of a painting that was begun in Germany and completed in America and perished shortly afterwards in a fire. 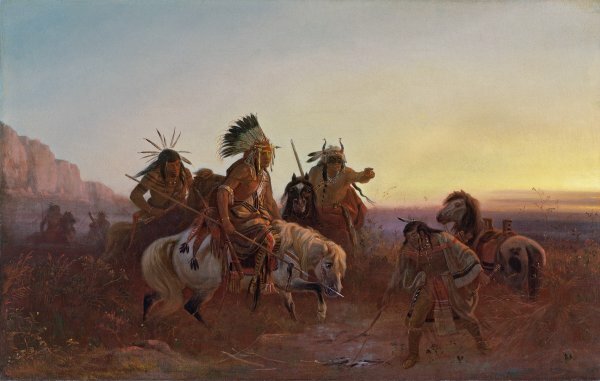 Painted in Saint Louis, as the inscription states, shortly after Wimar returned from a stay in Düsseldorf, it depicts a group of Indian warriors on horseback searching for the trail of some enemy in one of the canyons of the lower Missouri River at dawn. Wimar depicts the Indians as exiles, roaming a land that is no longer theirs. Their appearance, with naked torsos and painted faces, reflects the stereotypes established by his contemporaries and European romantic fantasies about the free and adventurous life at the American border. Until he travelled to the West for the first time in 1858, almost at the end of his life, Wimar continued to portray Indians without ethnographic accuracy and drew inspiration from the works of other painters, such as the illustrations of Karl Bodmer, or certain literary texts like the novels of James Fenimore Cooper. Indeed, this scene could easily be taken from some passage from Cooper’s work in which the Indian Chingachgook was pursuing the trail of some enemy before it was scattered by the wind. Wimar uses a very powerful painterly language and a highly studied composition. In this respect he follows in the wake of certain paintings by his master, the history painter also of German origin, Emanuel Leutze. As Elisabeth Garrity Ellis points out, The Lost Trail in the Thyssen-Bornemisza collection repeats the same composition of diagonals as Leutze’s The Troops at Monmouth. The poses and position of the arms of the two main Indians can be related to those of General Lee and General Washington in the aforementioned painting and the foreground figures of both compositions are depicted in the same bending down pose.